Today’s Freebie Friday is eyelets. Eyelets are an oldie but goodie when it comes to creativity. One lucky winner will receive a sample of We R Memory Keeper’s eyelets. 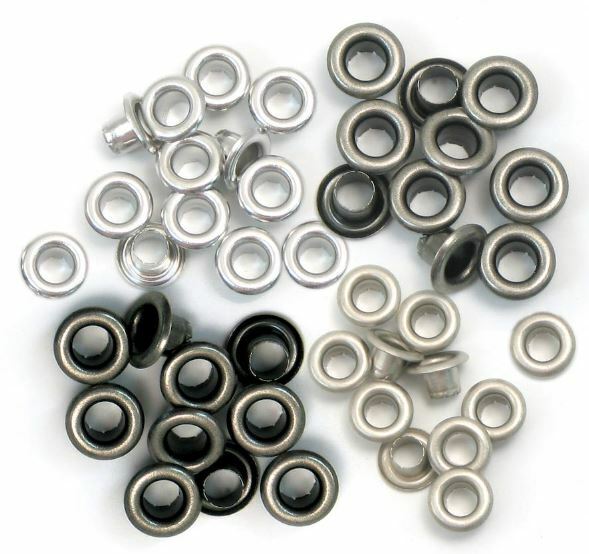 It’s simple to enter, just answer this question: what do you currently use to set your eyelets. Make sure to share this giveaway opportunity with your friends. Cross your fingers and check back on Monday to see if YOU are the winner. Happy Freebie Friday. Hi everyone! My name is Izzy Anderson and I’m so excited to be guest designing for We R Memory Keepers today. Have you seen the fun, new line, Feelin’ Groovy? Like the name suggests, it rocks a retro vibe. I was immediately drawn to the bold design of the patterned paper named “Groovy.” The pretty blue-green palette reminded me of the beach and I thought it would be the perfect backdrop for my page. I printed my 3×4 inch photos, added some patterned paper, chipboard stickers, embossed stickers, and washi tape to my pages before punching them in the Cinch machine. In order to fit all of this on each page I created some fold-out journaling flaps. I cut apart the journaling cards on the Notecards paper and used them as my journaling flaps. They’re just the right size! …then place another length of washi tape along the other side so that half overlaps onto the background paper. I keep this Cinch book in a basket out where my kids can look at it and enjoy the fun memories they’ve had this school year. It’s the perfect way to see the growth they’ve experienced. Who doesn’t LOVE a little Baker’s Twine (or a lot of Baker’s Twine) when it comes to crafting? Well today might be your very lucky day. Simply answer the following question and you’ll be entered to win a sample of this awesome product. 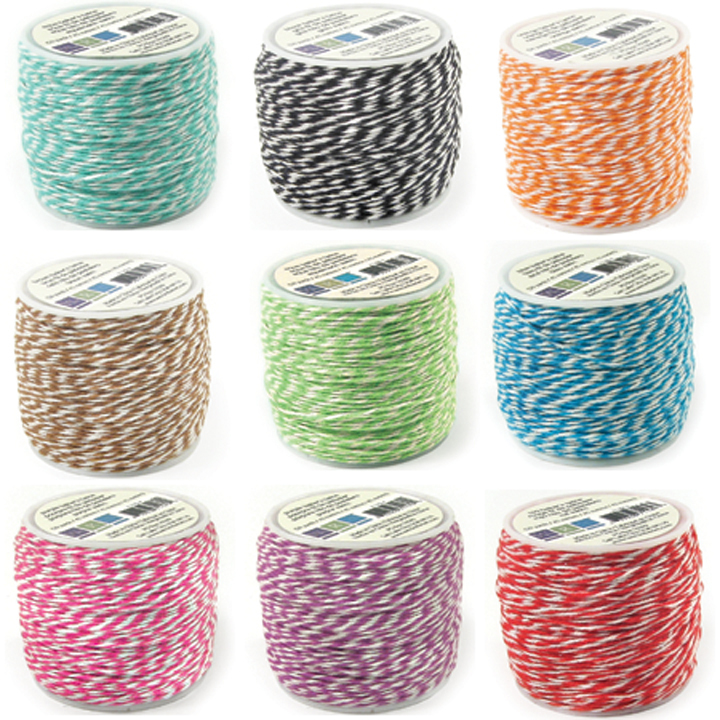 What’s your favorite Baker’s Twine color? Let us know and you’ll be entered to win. Check back on Monday and we’ll announce the winner. Best of lucky and Happy FREEBIE FRIDAY. Here’s a fun challenge to help you use up your scrapbook stash and enjoy your favorite new goodies at the same time: create a project (scrapbook page, card, tag, decor, etc) using something old and something new. Of course, old and new are relative terms, but let’s say for this challenge that “old” means something not from this year, and “new” means something you purchased this year. Sound good? For this challenge I grabbed some goodies from one of my all time favorite older We R collections, Good Day Sunshine. I combined those with some of the new colors of Washi Tape released this year. I love to have spare cards and tags on hand for friends, neighbors, birthdays, weddings, etc, so I created this friendship tag with my “old” and “new” products. After cutting my tag shape out of one of the papers from the 4×6 pad, I layered some more paper, washi tape, embossed stickers, and chipboard stickers. To finish off the tag I added a couple of glitter brads, an eyelet, and some baker’s twine. Easy peasy, and I used up some of my stash–a win/win for sure! Today we are happy to have Apryl Holland as our Guest Designer. Hello! I am so excited to be featured as a Guest Designer! 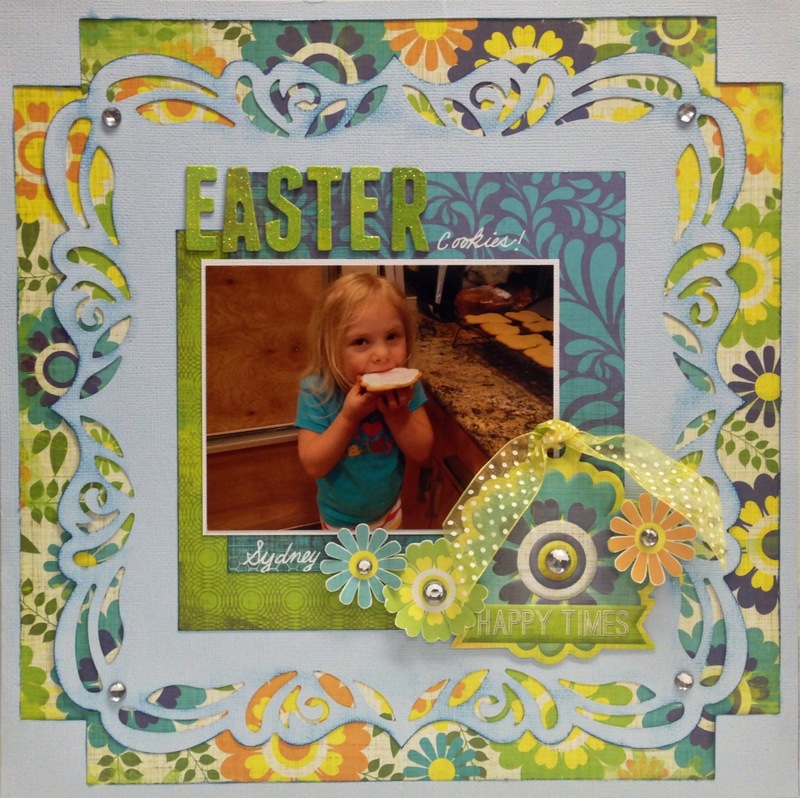 I had the pleasure of working with the Feelin’ Groovy Collection and created a 12×12 layout. This collection is full of bright colors and patterns and was really fun to work with! And it’s perfect to scrapbook my daughter that’s taste testing the cookies, yum! Welcome to Tutorial Tuesday! Aly here (I get to see you each Tuesday and Thursday–lucky me!) to share an easy DIY paper party hat with a free printable template. I actually made this hat for my daughter to wear on Crazy Hat Day at school during Red Ribbon Week. But you can use this template and tutorial to create your own custom hat for any type of celebration. Step 1: Download the printable party hat template HERE, cut it out, and trace it onto your patterned paper. Cut out the party hat, form a cone shape, and hot glue the edges together to secure. Step 2: Cut several 3 x ¼ inch strips of Feelin’ Groovy patterned paper using the Twist Trimmer. Use a rubber band to secure them together at the bottom. Insert the ends into the top of the hat so that the rubber band is covered and secure with hot glue. Gently bend the strips down and fan them out. Step 3: Add some border strips cut with the Twist Trimmer, a Feelin’ Groovy embossed tag tied with baker’s twine, and some embossed Feelin’ Groovy stickers. Secure them with hot glue. Step 4: Add eyelets to the bottom sides of the hat and tie some baker’s twine to hold the hat in place on the birthday child. 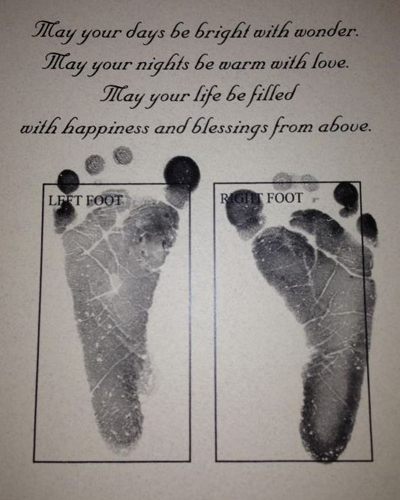 We have some exciting news………………………..
Help us congratulate a new little on to the We R Memory Keepers family. 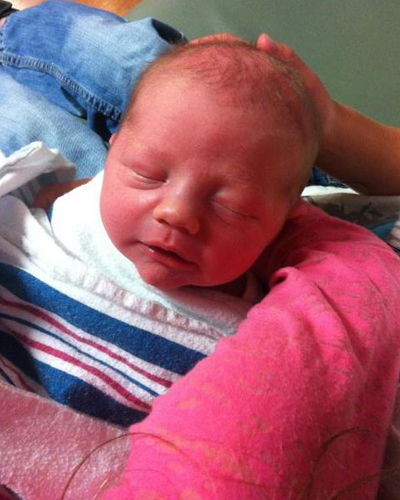 Grayson Hiller was born to the president of We R Memory Keepers on May 17th. Grayson was 8 lbs 5 oz and 20 inches long. 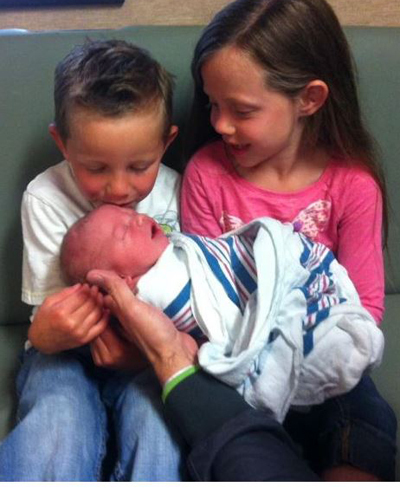 He was welcomed by a VERY excited older sister and brother. We are so happy that both mom and baby are doing well. Check out how big his feet are!